This is the ultimate surf camp for any adventurers out there. Live new experiences as you level your surfing up to the next level. 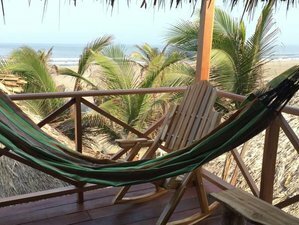 Surf on the shores of Bolivar, Colombia and stay in beautiful hotels in the city and learn from instructors with years of experience in the practice and teaching of nautical sports such as surfing, kitesurfing, swimming, wakeboarding, among others. You will be staying for four nights in Posada Kalea. Posada Kalea is located in the north area of the city of Cartagena de Indias, on one of the most extensive beaches of the “Corralito de Piedra” and only a few minutes from the most important hotels in the city, Las Americas Convention Center, two kilometers from the Rafael Núñez International Airport (CTG) and only seven kilometers from the historical center. You will have an eight hour-kite course all throughout the camp. This camp is open to beginners, intermediate, and advanced surfers. Profesional Kiter, Colombian Champion in Freestyle and Race for many years. This surf camp will take place in Cartagena, capital of the region Bolivar, Colombia. Cartagena is a magical city, full of joy in every corner. La Boquilla, the neighborhood where the surf camp is located, is one of the corregimientos in the north city area and the one with the most extensive beaches. At first glance, La Boquilla may not be the most attractive neighborhood because it has been marginalized by the current country situation, but thanks to its friendly people and their willingness of getting ahead of everything that comes through, makes this neighborhood a real charm where you can find incredible places. %Posada Kalea believes in La Boquilla, its people and its potential, that’s why they bet on an economic development that brings well-being to the whole community, on honesty and hard work and on giving a good example of behavior and commitment to generating a positive change. Please book your flight to arrive at Rafael Núñez International Airport (CTG). The deposit is fully refundable if the booking is cancelled up to 8 days before the arrival date. Posada Kalea is an excellent place to kite and relax. At our hostel you can enjoy a quiet and magical stay by being surrounded with beautiful beaches and sea.